Just a little thing, he couldn’t have been more than six or seven with dirty blonde hair and big eyes that took in every detail of his surroundings as though his very survival depended on it. Maybe where he came from it did…I don’t know. I didn’t know his other world and had never experienced it. I met him in this world, my world. I was in my twenties and living life like a twenty something year old, with little regard for my environment and nary a worry in the world. My world was full of fast cars, good times, and excess around every corner. He entered my world on a Saturday afternoon, with his innocent face and those eyes that told a story of things I had only heard of in stories. I met his parents and older sister for the first time that day as well. We took them to a local restaurant for dinner that evening, and the adults around the table made conversation and future plans for this brave family. I couldn’t take my eyes off him. I noticed he cleaned his plate, savoring the cheeseburger as though it was a feast fit for a king. Between bites, those eyes took in his surroundings. I’m not sure he even heard the conversation. I, myself, was only picking up bits and pieces when I noticed him carefully placing ketchup packets in his pockets. One by one, he slid them to the edge of the table, glanced around and filled his pockets until they looked about to burst. I knew what those pockets felt like because at that moment a blurred vision of a true survivor came to life before me and my heart filled to capacity. I wondered how many ketchup packets would be enough? Did he know? Did he have a number in mind? How many would it take to make his heart as full as his pockets? No one noticed the change in my emotions, nor the little boy’s actions that caused it. I remained silent, lost in my thoughts only glancing up to find him studying me. After dinner, I stayed behind and walked out with him. I told him he didn’t need to take the ketchup packets, but how do you explain to one so young that they will never go hungry again? How do you convince them that this new world he has just arrived in less than twenty fours ago, is one where ketchup will be presented to him in overabundance? How do you describe a feeling of contentment to someone who has watched everyone around him make do with so much less than my world is accustomed? There are no words, only experiences and actions that in time create the safety net he craved. That little boy is a grown man now with a wife and two beautiful little girls. He is successful and lives a good life. I’m not sure he even remembers those ketchup packets…it’s been so long. I, however, have never forgotten. Every time I’m tempted to throw in some extra ketchup packets with my order I think of him and his full pockets. My heart fills with pride for the man he has become, and I hold on to those ketchup packets much the same way he did so many years ago. They are my life preservers too. When I think I need more, when I think what I have isn’t enough, I conjure up his ketchup filled pockets and the look of sheer peace that came over him when full pockets meant a full heart. And, I pray that my focus will always be on achieving a full heart…even when my pockets are empty. 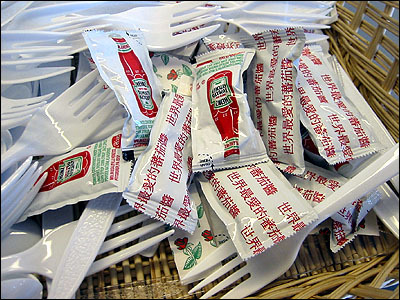 Do you have a “ketchup packets” story in your life that serves as a reminder to you? ← Has Magazine Prettiness Replaced Real Life? “I knew what those pockets felt like because at that moment a blurred vision of a true survivor came to life before me and my heart filled to capacity.” I love this line! How did you come to know the family? I love that this boy was able to make a happy ending! Powerful stuff! Thank you. That family was/is my family. My cousin, his wife and their two children who immigrated from Cuba. He was a doctor who gave up his dreams for the opportunity of a better future for his own children, much like my parents did for their children. This is truly a beautiful story, that touched my heart. I do recall a time when my father left us for the last time. We had very little money, had difficulty paying the mortgage on the house and the fridge was quite bare. My brother opened the fridge and spoke out carelessly with the brutal honesty of a young boy, “Mum we’re poor, there’s no food for us”. I looked at him quickly and told him to “hush up”, several times under my breath as he kept on looking at me as if I didn’t understand the obvious. I looked over at mum who had tears welling in her eyes, and realised how that comment pierced her heart deeply. I understood her pain as our childhood was very, very difficult indeed. She used to walk almost one hour to work every day to work each way to provide for us children, cleaning hotel rooms. Years later she told relayed the incident and said “You know how much it grieved my heart not to be able to provide food for my children”. I’ve never forgotten that look; it is forever embedded within my heart, and I always feel for the needy in society. Your story touched my heart, and I feel for that little boy you once were and still are, your brother and your mother too. As a mother, I can’t imagine being in your mom’s place trying to provide for my children and coming to that moment of realization that I can no longer keep them in my protective bubble and shield them from the realities of life. God bless your mother for finding the strength to move forward and obviously raise a caring and compassionate man in the process. Thank you for reading my thoughts and sharing your story with me. I echo what Adam said, about this story reminding him about his father. My parents were also immigrants to this country. And while they didn’t stow ketchup packets, they struggled to make ends meet. Thank you for sharing this heartfelt story. It was a gentle reminder of my roots and family history. I believe there are so many stories like yours, mine, Adam’s. It’s all in how we embrace them and allow them to shape us that’s important. If not for our parent’s choices and sacrifices, where would we be? I wrote a post that I’ve since removed to be included in my book regarding this topic. I believe good parents will always want their children to have more than they did, but it has come to be a fine balance. What will motivate our children if they never have to endure any sacrifices or go without like we did or our parents before us did? Thank you for reminding us that not all have always wandered in our world of plenty… how blessed we are. A very important life lesson. We are truly blessed to “wander in our world of plenty” and I hope to instill this in my children as well, although it seems a little more difficult to do in our world these days. I maintain hope. Great story. This reminded me of my dad. He came over to the States as a young boy. The family came from nothing. The stories I hear are similar to yours – coming from a place where even the basics were hard to come by, to a world where working meant thriving – not just surviving. A chicken to feed the family? Unheard of in the old country. Adam, the stories my family has told me through the years I hold close to my heart. I have never had to endure what they or your family did, and am not sure I’m equipped for it. I admire folks like my parents and your dad for the sacrifices they made for our future. Always enjoy your visits. Thank you. I enjoy your writing and story sharing, it’s my pleasure. Hi Adam, I was wondering where your father uprooted from? My parents came over from Europe when they were young kids too. That would make us both first generation, right? My dad came here from Austria, but my family migrated there from Romania then Germany. My mom was born here though, so I’m not sure how that would work? What is your heritage, Anka? Interesting! My parents were born in former Yugoslavia. Currently, a war torn country. I did have the opportunity to visit their home country before the civil war broke out. Learned something new today! Nice chatting with you, Adam! This is such a moving story, and one that makes you think. Thank you for this. Thank you. My posts are usually based on my life experiences, and I definitely try to write them in a way that they touch the reader and give a little food for thought in the process. My heart is full. My eyes too. A grand story. Thank you. I’m glad it touched you the way it has me for so many years. Bless his little heart. Thank you for sharing. Hey stranger! I’ve missed you. Hope you and Owl had an awesome Christmas. Thanks for the visit and comment.